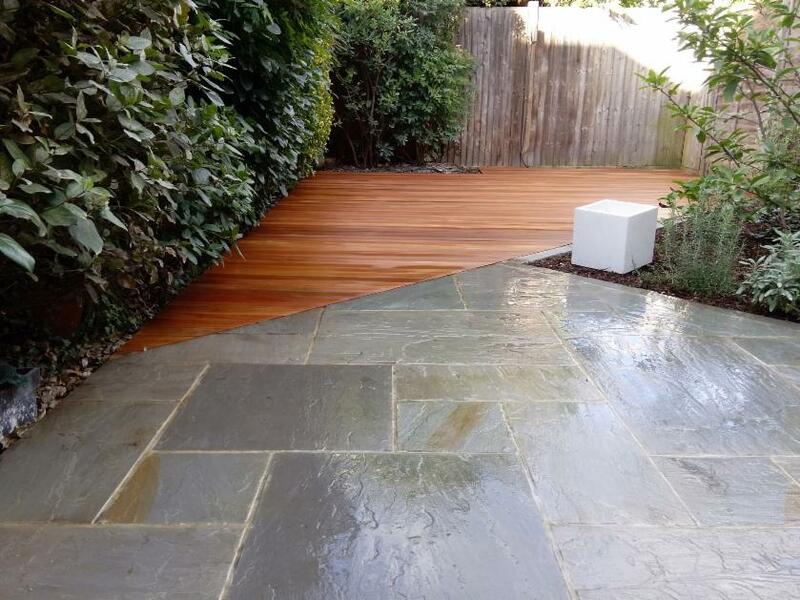 The London Paving Company are a London based landscaping and landscape design company covering Clapham, Dulwich, Balham, Herne Hill, Central London Kensington and Chelsea and all of London. Antique Yorkstone paving patio with bull nose stone steps, lattice trellis with old stock walls and grey wooden bin tidy. We offer a proffesional service combined with many years experience, we can create a beautiful new driveway, path, or patio which will add value to your home and give you years of pleasure. We offer a wide variety of paving styles and materials to suit any property, be it modern, traditional or contemporary. Granite cubes blue black bricks set as curves with mixed size Indian Sandstone paving. We provide a wide range of colour and design options from which you can select the most appropriate for your home. We offer advice on design, layout and all technical aspects of the installation. Weed free and low maintenance paving will not only make you life easier but will also add value to your property and enhance its appearance. Black Limestone paving with rendered block walls floating hardwood benches with paving uplights and formal topiary planting. Varieties of paving include York stone, Slate, Cobblestone, Indian Sandstone, Granite sets, all with authentic texture and shading. With over 100 colour combinations to choose from, we can ensure you will find the finish you are looking for. 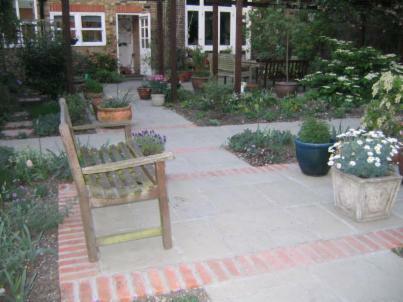 Recreation of a classic Victorian style paving walkways with large beds for mixed planting, herbs and vegetables. 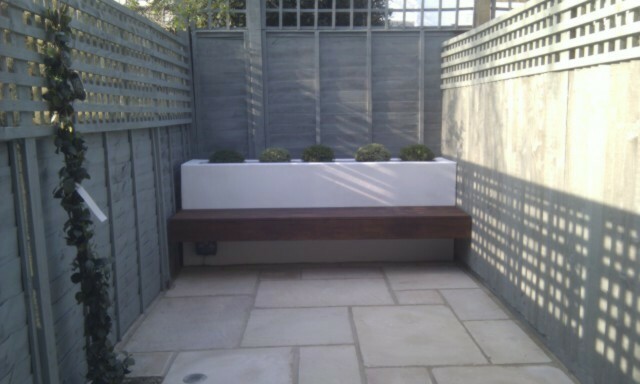 Mint Fossil Patio with floating bench and raised bed with olive green trellis and fence making the most of this small courtyard garden in Earlsfield London. 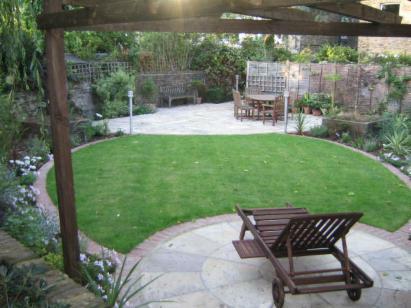 Small garden design London maximum space from a small court yard garden with black trellis to increase privacy without effecting light. Our portfolio illustrates the diversity of our work and how we design to our customers' different tastes and garden needs.